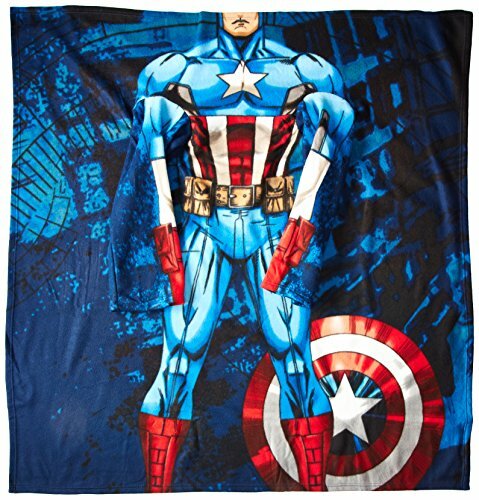 Marvel Captain America, First Avenger Youth Comfy Throw Blanket with Sleeves, 48" x 48"
Grab your shield and outfit yourself with this Marvel's Captain America "First Avenger" Youth Comfy Throw by The Northwest Company! Decorated with your favorite Marvel superhero, this blanket with sleeves is not only colorful and vibrant; but also soft and warm! Made of soft, luxurious fleece with oversized loose fitting sleeves, The Comfy Throw lets your upper body remain protected from the cold while leaving arms and hands free to use a laptop, TV remote, read a book, eat a snack, enjoy an outdoor sports event, and much more! Measures 48"x 48". Machine washable. If you have any questions about this product by Marvel, contact us by completing and submitting the form below. If you are looking for a specif part number, please include it with your message. © 2019 - silenceissedition.com. All Rights Reserved.